While it’s difficult to get a good read in the very first year of a draft class, you can get a preview of its collective potential. It’s more like a, “This player kinda has my attention and I am going to take a bigger interest in him” kind of thing. On the surface, I’m excited to see a lot of these players at South Bend next year. Some of them may not start there, but many may at least end up there by the end of 2019. I put the draft picks in categories to better discuss what could happen with them in the next year. Considering I have Nico Hoerner as my new No. 1 prospect, he’s the only one that’s going to fit in this category. He was just so dominant and sure of himself as a hitter that he easily outpaces any other prospect in the system right now. In just 50 at-bats, he hit .327 with a .450 OBP and a wRC+ of 184 at Eugene that jumped to 222 in South Bend. His season was cut short due to a wrist injury, but we’ll get more looks at him when the Arizona Fall League opens on October 9. That experience might make him even more sure of himself. Hoerner could start out at Myrtle Beach next year, but he might be at Tennessee if things go really well in Arizona. That is a rapid ascent. Cole Roederer and Brennen Davis might be the best high school position player picks the Cubs have taken in the Theo Epstein era. 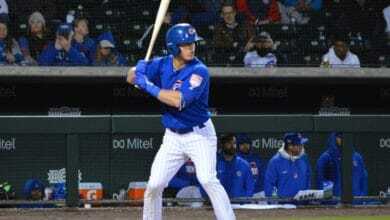 Yes, Albert Almora Jr. was a good pick, but not an elite one in terms of his hitting potential. Both Davis and Roederer have much better hit tools with some serious power and speed projection. Just how good they can be by 2021-22 — when I project them to reach the MLB level — is obviously still up in the air at this point. One look at their production from this summer and it is easy to get giddy, though Roederer played only 36 games for Mesa and Davis played just 18. Luke Reynolds, Derek Casey, and Andy Weber will all have pretty good careers in the lower minors. Reynolds and Weber will be able to hit for a decent average with a little power and Casey will do well as a starter at South Bend and Myrtle Beach. The question for all three is how they are going to do once they hit Double-A. They look to be extremely polished right now compared to the rest of the draft class. I really like what I’m hearing about Chris Allen and Niels Stone, two junior college pitchers who saw some time in relief for Mesa. Both had decent numbers in a small sample size. I also like how sixth round pitcher Kohl Franklin improved throughout August to post a 1.23 ERA for the month. I’m deeply intrigued by the 95 mph fastball of Riley Thompson, an 11th rounder out of Louisville. Thompson was quite good for Eugene in August with 14 strikeouts in 11.1 innings while not allowing a run. He was good again in his lone September start, striking out seven in five innings. He still needs to work on commanding and controlling his secondaries, but his fastball is extremely effective, especially down in the zone,. Two other arms I was surprised by this year were pitchers Blake Whitney from South Carolina-Upstate, who was in Mesa, and lefty Jack Patterson, who pitched mostly for Mesa before joining Eugene’s playoff roster. Whitney struck out 37 with a 2.30 ERA 31.1 innings and Patterson had a 2.83 ERA in his limited time. Pitchers Jake Reindl from Arkansas and Josh Sawyer from Texas were shut down for the year as they played major roles for College World Series participants. I like what they bring to the table, but we’ll have to wait for next year to see what they can do at the professional level. While it’s too early to even consider a grade, the Cubs should pleased with the production and potential the this draft class has shown so far.